Yes, a day off to golf helped me decide on a subject, and I became a painting machine! Lake Cherokee stole my heart. 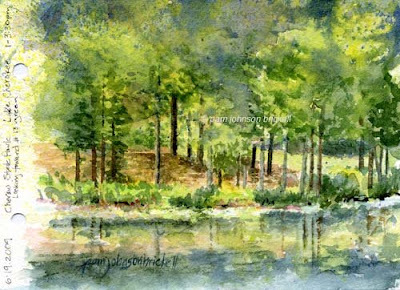 A number of views were screaming to be painted but, since the temperature was climbing into the 90's and the humidity rising, a shady spot next to the lake's outlet won. We arrived at the chosen spot, just below the 14th green, around 10:15. There was a wonderful breeze off the lake (well, really it's a pond) and the shade was divine. 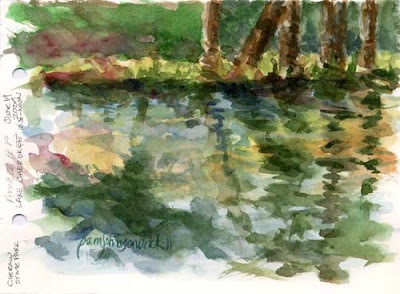 I decided to do two studies of shoreline reflections, at the same time, using traditional watercolors. One on Kilimanjaro 140# cold press wc paper, the other on Arches 140# hot press. It was helpful to work this way, as while one was drying I'd work on the other. Sometimes, I can get a little itchy waiting for watercolors to dry. This was a great solution. The paintings are on 5.5 x 7.5 sheets. After a bit of working on both, I put most of my energy into the Kilimanjaro CP paper study. The hot press just didn't have the same glow. After our picnic lunch, Rob decided he'd had enough heat, so I drove him back to the cabin. Upon returning to the same location, the shade was greatly reduced and the reflections weren't nearly as captivating. But, the far shoreline of Lake Cherokee was glowing. I found enough shade, and even though the breeze had died down, I quickly became ensconced along a narrow piece of shaded shoreline. 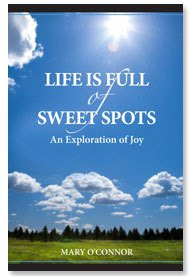 We journeyed out again after dinner. I was high from the day and exhausted by the heat. That's the excuse I'm using for this next sketch :) Yuck! An experiment that I'm embarrassed to show but, I like the subject and am happy with the perspective acheived. Using this particular toned paper with General's sketch and wash pencil and watercolor pencils just didn't work. Before I forget again.... 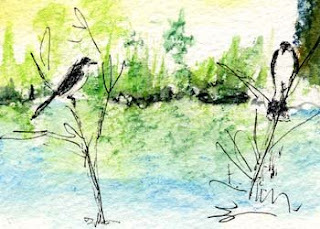 Everyday we've had the pleasure of Eastern Kingbirds, Tyrannus tyrannus. By far the most seen bird in our travels. 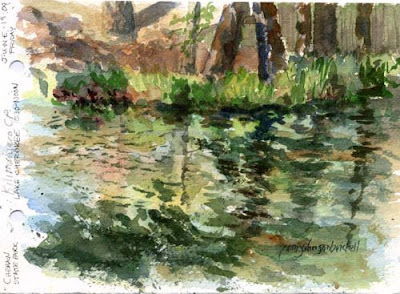 This sketch is from our first evening at the park when we were checking out Lake Juniper. Corinna, the park's Natural Resource manager, was to contact me about taking us down to the cypress swamp on Saturday. She has a boat with a small motor. You can kayak or canoe there but, it takes one hour each way. Not something we wanted to tackle in this heat! 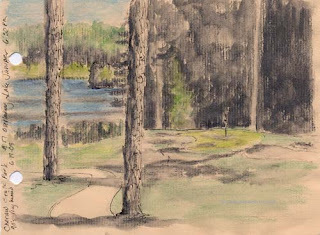 When she called, Corinna apologized for not being able to accommodate us but, did have an arial map of trails we could take a golf cart on, that would get us to Lake Juniper's headwaters and cypress swamp. I double check about golf cart worthiness :) Woo Hoo! Cypress Swamp here we come....... tomorrow! These are really lovely. I like how you can see the wind ruffle the water surface.